I just purchased the Pro version yesterday because the photo screensaver I have been using for years is not compatible with Windows 10 whereas your screensaver is. I'm very impressed by your screensaver, and it has many more transition effects than the one I had been using. 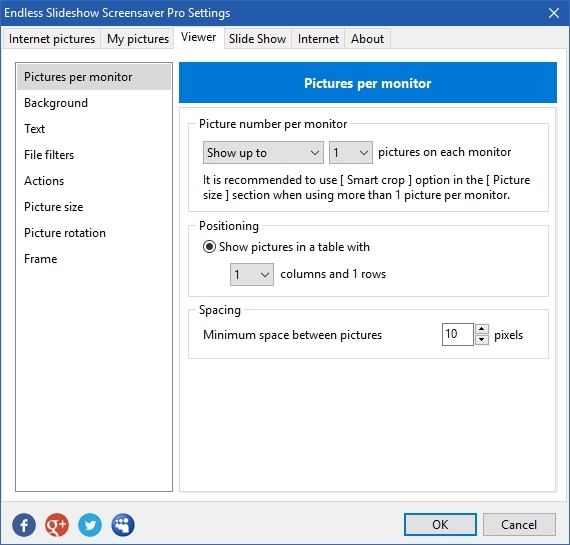 The only significant feature the other screensaver offers that your does not is that one of the options is to intermittently display multiple photos on one screen -- sometimes 2, sometimes 4, the maximum being something like 16-20. It would be great if you could add that to requested features list. Yeah, this one is already in the to-do list. Wow, this is a great feature, thanks! If the screensaver is displaying some photo specific piece of information (like file name), is there a way to have it do so for each photograph displayed (if more than one)? Currently, it displays something like "[filename] and 1 more..."
Yeah, I was thinking about it... If I find a simple way for users to configure this kind of overlay text, then I'll add it. Curently you can press "C" on your keyboard (in Pro version) to have all file names copied to Windows Clipboard.